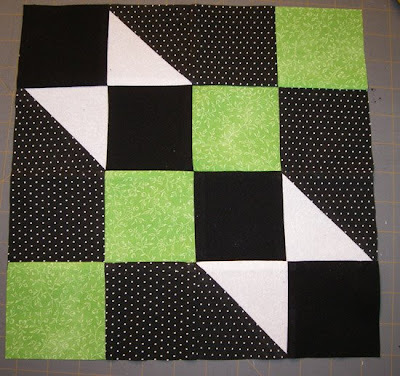 I think I'm going to really like this Lime Quilt! Here's one block finished. The block finishes 12" square. The digital camera is having problems capturing the polka dots correctly. It make the block look crooked but it really turned out pretty straight. Now only 29 more to go plus borders. My goal is at least one block per day. It's a slow goal, but, I also have 4 breast cancer quilts to assemble that I volunteered to complete. Here's the lime block. Below is a trial layout of my first of four Breast Cancer Quilt for the Breast Cancer Warrior Quilts. 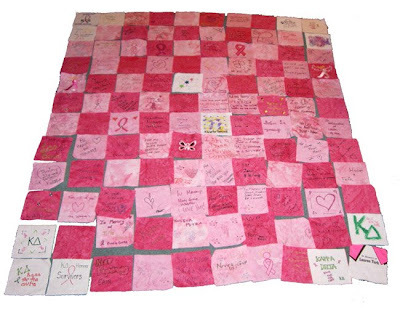 As members attended the race, they brought or created a square on pink fabric provided or brought their own. Some on white, some on others. Here's a trial layout. There are more light pink blocks than darker and I am OK with the areas of repetitive light pink. These will be taking a lot of my time over the next couple of months. I'll keep you posted on the progress. The green you see in between the blocks is my carpet. Congrats Pittsburgh Penquins NHL 2009 Stanley Cup Champions!! !